Bangkok, Thailand: Thai wildlife officers have arrested a Malaysian man attempting to smuggle two baby orangutans, 51 tortoises and six raccoons into the kingdom across its southern border, officials said Thursday. 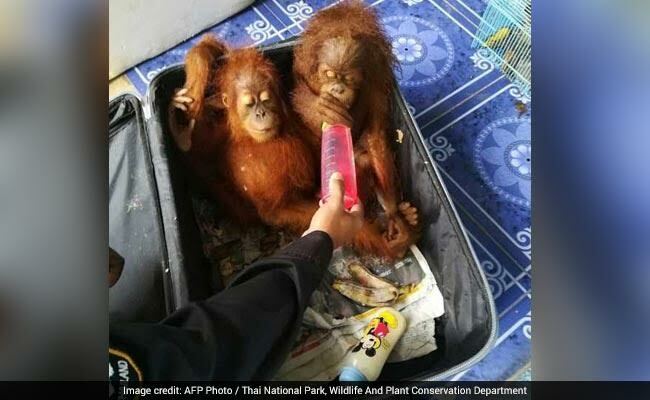 The animals were packed into plastic boxes and suitcases loaded into Ismail Bin Ahmad's car, officials said. The 63-year-old was stopped Wednesday as he was attempting to drive through a border checkpoint in Thailand's southern Songkhla province -- part of an insurgency-torn region known as a funnel for drugs, weapons and other contraband. "The suspect said he was hired to transport the animals from (neighbouring) Perlis state in Malaysia to Hat Yai (in Thailand) for 1,000 baht ($33 dollars)," Prach Kongthong, a wildlife officer manning the checkpoint, told AFP. Most of the 51 rescued reptiles were Indian star tortoises -- an endangered species from South Asia coveted for its star-patterned shell.